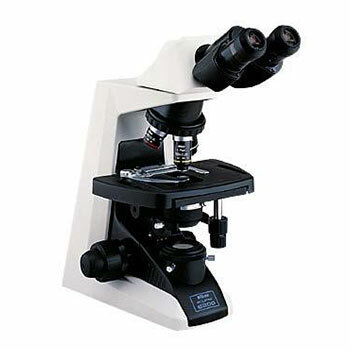 The Eclipse E200 is a routine upright microscope with outstanding optical performance combined with ergonomic touches. Ideal for education and routine laboratory use, the Eclipse E200 incorporates Nikon’s revolutionary CFI60 optical system, the first routine upright microscope of its class with such an advanced optical specification. With objectives correcting both chromatic aberration and curvature of the field of view, plus longer working distances and higher numerical apertures. The Eclipse E200 provides clear bright images at every magnification. The result is first class optical quality at a modest price. Designed for a wide range of users, the E200 is suitable for the inexperienced novice and incorporates a number of design features that protect slides and objectives from damage. When using short working distance objectives, for example, the upper limit of the stage movement can be set so that the objective does not hit the specimen slide – protecting both from damage. Thanks to this feature, even novices or operators who need to change slides often can perform their job easily and quickly. Copyright © 2002-2019 Microscope Service & Sales. All rights reserved.